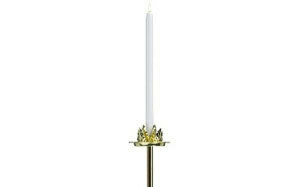 Unity Candle Lighter - 16"
We offer an enormous selection of commercial grade floor candelabras. It’s easy to find a style that matches any venue and occasion – from sleek, modern designs to something more traditional, you can find it all within our catalog. 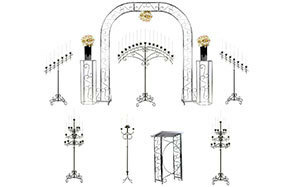 Each model brings with it a unique style that ranges from single candle holders to extravagant candelabras that can handle up to 15 votives or tapers. All come with our lowest price guarantee. 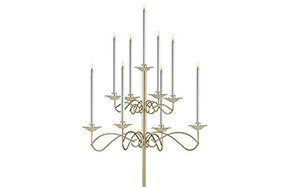 A floor candelabra can make any setting even more elegant. 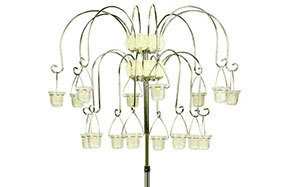 Multiple floor candelabras will work even better, fortifying the mood with intimate illumination for any special event. There are many important occasions in the average person’s life that call for a higher degree of celebration. From holiday, anniversary and birthday parties to wedding ceremonies, receptions, graduations and retirements – there are many reasons to plan something big! The success of any of these events relies heavily on the venue. Too much or too little lighting can make things uncomfortable or may create the wrong atmosphere. Our standing candelabras are designed specifically for any of these festive situations. Dim the built in lighting and add a few wax or LED candles and you can transform any room into a glorious party area. 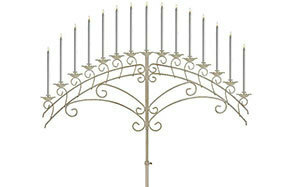 Even outdoor settings can be optimized by adding a few floor candelabra. As the sun sets, let the gentle flicker of flame keep things going so the celebration can continue. Make every occasion something special by adding your own embellishments to each candelabra. A few strategically placed bows, boughs or a few charming bouquets can capture the spirit of the event while the sturdy candle holder provides the lighting. 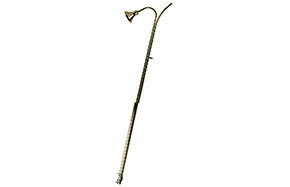 Simply tie to the slender base or around one of the support arms to recreate the venue accessory over and over again! Appearance is very important, but so is convenience and quality. 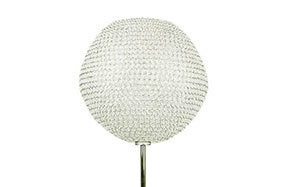 Our floor candelabras include the best of everything. Many break down into smaller pieces so you can easily store in tight spaces. Assembly takes almost no time at all, which can help reduce set up time. Pair your floor candelabra with our handy accessories, which include rechargeable LED candles replacement holders, glass chimneys, snuffers and lighters. There are many ways to get more mileage out of each candelabra you purchase! Make your next party or ceremony an event to remember! Let our durable floor candelabras light your guests’ way as they take in the beautiful décor, gourmet tidbits and other elements featured at the celebration. Every life milestone should be commemorated in a way that is fitting and memorable. Our floor candelabras know exactly how to show your party goers a good time with the right lighting level and a touch of elegant beauty! 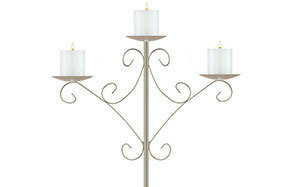 Our candelabrum will give your church a warm, welcoming appearance. Religious buildings are often recognized for their architectural beauty. Candlelight is often the preferred light source to enhance the visual appeal and meaning behind each area contained within. 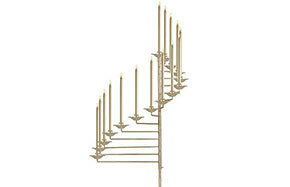 We offer a wide range of church candelabra styles that will make any facility thought provoking. From traditional to modern, we can provide you with high quality luminaries that will last for many years. Stay within your spending limits and still give your church interior the attention it deserves with our elegant candelabra models! By J Jones from Jacksonville, FL on January 23, 2012. 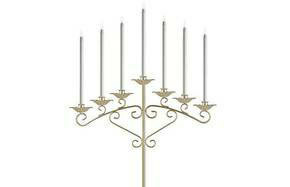 This is a beautiful candelabra. It is easy to put together, seems sturdy and great for the price. By The Wedding Planner from Buckley, MI on February 23, 2011. I love the white finish - It is easy for the brides to add their color to it and this makes it very personal for each one. Easy to clean, no worry about wax drippings.